Charge and exciton motion usually proceeds via a sequence of incoherent hopping events in conjugated materials. This is driven by the strong coupling to vibrational degrees of freedom in highly ordered systems like single crystals or polycrystalline thin films. Charge and exciton localization also results from the disordered energy landscape associated namely with the presence of conformer subunits along polymer chains or different dielectric environments in bulk molecular materials. We model charge and exciton transport by solving Pauli Master Equations or by performing Monte Carlo simulations based on a quantum-chemical description of the charge and energy carriers on individual molecules or conjugated subunits (weak coupling regime). These simulations are used to predict, among others, charge carrier mobilities and exciton diffusion lengths, which play a key role in the working principle of a number of opto-electronic devices. 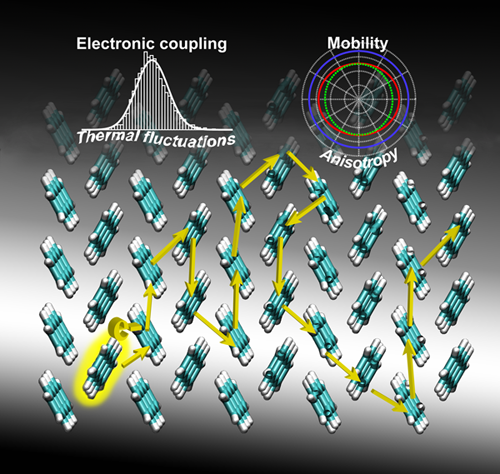 These calculations can be extended to the case where strong quantum-mechanical coupling between the molecules yields delocalized eigenstates that diffuse in the material through scattering by phonons. The results reflect the subtle interplay between the supramolecular organization of the individual conjugated units, the time-dependent electronic/excitonic energies of these units and the couplings among them, and the resulting charge/exciton transport properties. E.V. Emelianova, S. Athanasopoulos, R.J. Silbey, D. Beljonne. Physical Review Letters 104 (2010) 206405. Does Supramolecular Ordering Influence Exciton Transport in ConjugatedSystems ? Insight from Atomistic Simulations. T.A. Papadopoulos, L. Muccioli, S. Athanasopoulos, A.B. Walker, C.Zannoni, D. Beljonne. Chemical Science 2 (2011) 1025. Unravelingthe Mechanism of Molecular Doping in Organic Semiconductors. Mityashin, Y. Olivier, T. VanRegemorter, C. Rolin, S. Verlaak, N. Martinelli, D. Beljonne, J. Cornil, J.Genoe, P. Heremans. Exploring the Energy Landscape of the Charge TransportLevels in Organic Semiconductors at the Molecular Scale. Cornil, S.Verlaak, N. Martinelli, A. Mityashin, Y. Olivier, T. Van Regemorter, L.Muccioli, C. Zannoni, F. Castet, D. Beljonne, P. Heremans. Accounts of ChemicalResearch 46 (2013) 434-443. Triplet ExcitonDiffusion in Anthracene Crystal: Role of Local and Non-local Electron-PhononInteractions. Grisanti, Y. Olivier, L. Wang, S. Athanasopoulos,J. Cornil, D. Beljonne. Physical Review B 88 (2013) 035450. Probing the Relation Between Charge Transportand Supramolecular Organization Down to the Angström Resolution in aBenzothiadiazole-cyclopentadithiophene Copolymer. Niedzialek, V. Lemaur, D. Dudenko, J. Shu,M.R. Hansen, J.W. Andreasen, W. Pisula, K. Müllen, J. Cornil, D. Beljonne.